There are 3 paintings in this set. The originals are acrylic on canvas, 4' X 5', a commission for Joni's in Snyder. Everything in these pieces are or have been located in Scurry County. "Snyder's Past" shows way in the distance a herd of buffalo and one white buffalo. 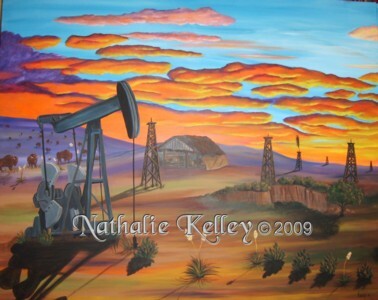 The wood oil wells are things of the past but the oil still flows in Scurry County.